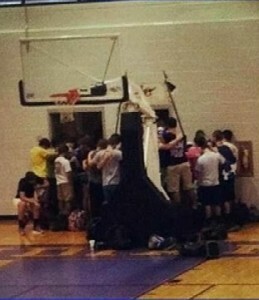 On May 1, a “spontaneous” prayer began in the offices of a Lumpkin County High School coach. According to news reports, it was a started by a student at either 7:30 am or 8:00 am and continued for three to six hours, depending on the source. 50 students and at least four members of faculty were involved. Five if you include the coach. The students were informed through the newest in rumor control devices, cell phone text messaging. The Freedom From Religion Foundation claims that four teachers abandoned their classes to attend this prayer vigil. FoxNews Atlanta (Fox 5), three of the teachers left their class to a teaching assistant while the fourth abandoned the students completely. It appears that the Superintendent will not be disciplining the Coach John Doe (still unnamed) the principle of the school for allowing this prayer vigil to take place, and the students use of cellphones while in school, a clear violation of the school’s student code of conduct. Examining multiple reports, it appears that a student had questions concerning faith and God. The student went to one of the coaches, “a man known for his Christian faith,” for advice. Which coach becomes another murky issue. It appears that discipline of the students involved is justified under these terms. Coach Doe, though being asked for advice, should know that any discussion of religion is outside his responsibilities as a coach and while on school grounds that his/her capacity is education and coaching, not Christian religious studies. By faculty and possibly school administration allowing and joining the students in prayer during class hours and supported by school staff may be a possible violation of the Establishment Clause. The fact that the coach permitted students and faculty to join in this vigil, during school hours would indicate that he had sanctioned the prayer. That the coach was representing the high school and school district is not in dispute. Therefore, the coach’s actions would lead the possible violation of church and state separation. Does the action have a secular legislative purpose? Does the action have the primary effect of either advancing or inhibiting religion? Does the action result in an “excessive government entanglement” with religion? In this situation, it appears that the coach clearly established the advancement of his faith and created an ‘excessive government entanglement’ by promoting his faith’s religious traditions to the entire high school in the guise of a prayer meeting. The “proofs” of violation is the perception of the persons affected, not the provider of the religious service. If students or parents of students believe this activity disrupted education in any manner, the activity crosses Jefferson’s wall of separation. Calls to the Lumpkin County School Board have not been returned at this time. I am afraid that this is an important story that will be dropped from the national and regional stage. I am afraid that the religious-right will take this incident to enhance their already inflated vision of a war against Christians. the use of cell phones to announce the prayer activity was in direct violation of Lumpkin County School’s code of conduct. This entry was posted in Christianity, Church/State Separation, Constitution, Education, Ethics, First Amendment, Politics, Religion and tagged Christian, Christianity, Church and State, Constitution, Education, Ethics, First Amendment, Georgia, God, Lumpkin, Lumpkin County, Politics, Religion, School prayer, Separation, Thomas Jefferson. Bookmark the permalink.